Lodger facility for an RN Air Section on RAF station. 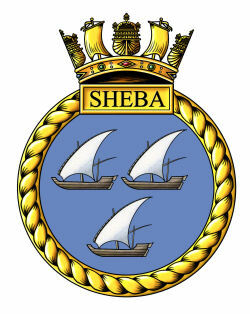 Transferred to Admiralty for development as RNAS. Support of 2 disembarked squadrons. War Reserve airfield on Care & Maintenance basis post war. The airfield is situated in flat, desert country, ½ mile from the NW. shore of Bandar Tawahi, and 5 miles WNW. of Steamer Point, Aden. 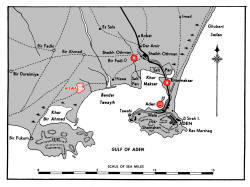 It lies 4 miles N. of Liottle Aden peninsular, and 2½ miles WSW. of the village of Hiswa. 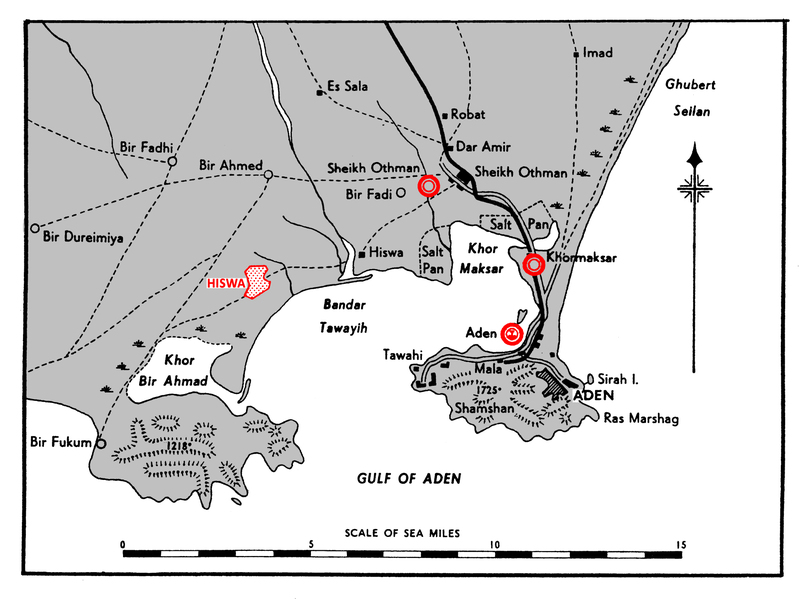 The peninsular of Aden and Little Aden. Wadi Al Kahir, with stretches of cultivated land along its banks, distant 2 miles ENE. running in a SSE. direction to the coast, at Hiswa. The runways show up distinctly against surroundings. Access by road to Sheikh Othman (distant 7 miles (R) ENE. 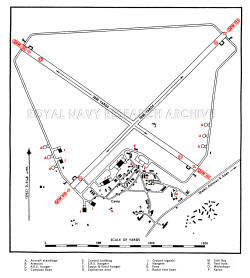 ), to Khor Maksar airfield 11 miles (R), to the town of Aden and to Steamer Point 16 miles (R). No railweay. Control Building on S. side of landing area, 180 Yds. S,. of runway intersection. Two, all weather, Gypsum laid on prepared ground with strips of cleared ground, 25 yards wide, on either side; the cleared strips are apt to become muddy after rain, which is very infrequent. 05/23 QDM. 045° -225° ....1970 x 50 yds. 13/31 QDM. 125° -305° .... 2000 x 50 yds. Little Aden peak (1218'), distant 4 miles SSW. and Jabal Shamahan, Aden (1725'), distant 6½ miles ESE. Two windsocks, to E. and to W. of runway intersection. Mobile beacon lights, parafin flares, glim lamps, amgle of glide indicators. Temporary living quarters in bungalow huts, S. of landing area. One combined with A/C Radar test base. Six hardstandings in storage hangar area. On SW. and S. of landing area. Sick Bay on airfield. R.A.F. Hospital at Steamer Point, Aden. Air Ministry provide Meteorological facilities. Prevalent winds: September - April, ME. to E. May - August, variable. Herat is intense at Middy. The airfield lies outside the main dust storm area. 10,000 gallons, stored in drums. A/C Radar base combined with Compass base. Suitable for Cannon, under construction. One A.R.S. hangar (Callendar), E.R.S. and general workshops under construction. Information taken from CB 4368 B. Admiralty Handbook of Naval Air Stations Aug. 45 and B.R. 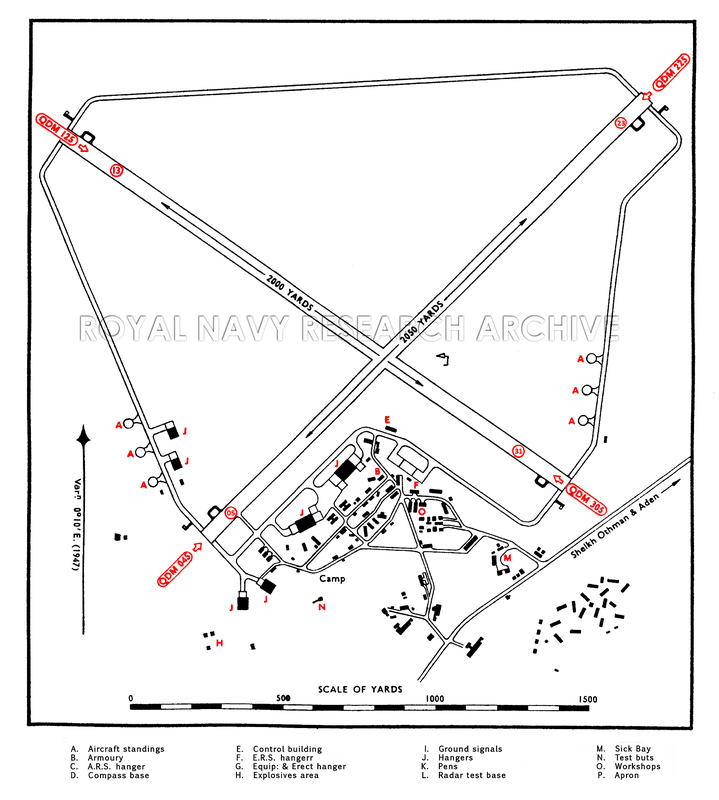 1807 andbook of Royal Naval Air Stations Dec. 48 +amendment Mar 1952.